Achieve ITIL Foundation certification success! This course provides the knowledge needed to pass the Foundation Certification exam, and two credits towards ITIL Expert certification. Gain an essential understanding of the ITIL framework as well as the best practices to more effectively manage IT service delivery to customers. Choose from multiple training options including our Premium Access Bundle with ITIL Certification Success Package, or a blended on-demand with live review version. The Learning Tree ITIL Foundation Certification blended training includes unlimited access to 8 hours of on-demand content presented by a real-world ITIL-certification practitioner and in-class or live online attendance in any ITIL Foundation review session occurring during the duration of your annual subscription. It provides comprehensive coverage of concepts within the Information Technology Infrastructure Library (ITIL). In order to pass your ITIL Foundation exam, you are given practical assignments, practice exam questions and daily review sessions. You will also explore and evaluate good practice in IT service management based on the ITIL methodology. You also assess the activities, roles and security issues involved in the service management lifecycle, examine the components of each of the core service management. Achieving the ITIL Foundation certificate provides two credits toward your ITIL Expert certification. You will be provided with a PeopleCert Exam Voucher including their Web Proctoring Service and a second voucher if you are unsuccessful on your first attempt. Those interested in controlling IT costs, improving IT service quality, and balancing IT resources. All IT professionals, IT project managers, IT managers, IT project or team members, network operators, business process analysts, IT architects, consultants, systems integrators, help desk managers and staff, planners, managed service providers, outsourcers, application developers, and other IT-related positions. How will the app help me prepare? This official app available for iOS devices provides you with everything you need to practice answering questions and monitoring your learning progress. MOCK EXAMS: sit multiple mock exams with a different combination of questions every time, the closest experience you will get to the real exam! EXCLUSIVE CONTENT: the questions and answers are exclusive to this app and were written by the ITIL Chief Examiner, each question replicates the style, topics and content of the official exams. How will the digital ITIL Foundation book help me prepare? This official handbook provides an introduction to the ITIL service lifecycle model and an overview of the ITIL qualification structure. It’s a great place to start your journey and contains a chapter on each of the components of the lifecycle: service strategy, service design, service transition, service operation and continual service improvement. The book is provided digitally. We will send you your access code and instructions to download the book. You can download the book on up to six devices you own making it a key reference aid in the workplace and while travelling. The Learning Tree ITIL Foundation Certification training course includes 18 hours of Instructor-Led Training (ILT) or Virtual Instructor-Led Training (VILT) presented by a real-world ITIL-certification practitioner. The course provides comprehensive coverage of concepts within the Information Technology Infrastructure Library (ITIL). In order to pass your ITIL Foundation exam, you are given practical assignments, practice exam questions and daily review sessions. You will also explore and evaluate good practice in IT service management based on the ITIL methodology. You also assess the activities, roles and security issues involved in the service management lifecycle, examine the components of each of the core service management. The ILT/VILT versions of this course offer you the opportunity to earn the following industry credits and certifications. Before your event, you will be sent a Pre-Course Study Guide and the ITIL Foundation Handbook. The Pre-Course Study Guide will let you know which parts of the ITIL Foundation Handbook you should study before class. The Pre-Course Study Guide also contains the official ITIL Foundation Certificate syllabus, which you should read. In addition, you should either attend a live session or view a recorded version of webinar 1091, “Preparing for Your ITIL Foundation Course.” You may sign up for the live version with Customer Service. The recorded version can be found in your My Learning Tree in the My Future Courses/Wish List section. Attending the webinar or viewing the live session will help prevent your being overwhelmed by new information the first day of class. The Information Technology Infrastructure Library (ITIL) is a customizable framework for good practice of IT services and infrastructure. ITIL was developed in the 1980s by the Central Computer and Telecommunications Agency, which later became the Office of Government Commerce (OGC), a governmental organization in the United Kingdom. ITIL has evolved to become the world-wide de facto standard for IT service management and encompasses multiple components of IT service management, including service strategy, service design, service transition, service operation and continual service improvement. These disciplines represent a service lifecycle framework that enables IT to better align to the business and solve specific operational needs. ITIL is not about creating things like projects do, it’s about delivering IT services that demonstrate real value to the organization. What is ITIL used for? IT service management ensures organizations effectively and professionally manage and support the people, processes and technologies within a business environment. By applying the ITIL service management practices covered in this and other ITIL courses, organizations can reduce costs, improve Return on Investment (ROI), enhance productivity, and maintain a consistent standard for service delivery. How much does the ITIL Foundation Exam cost? What is ITIL Foundation certification and why should I earn it? ITIL Foundation is the entry level certification which offers you a general awareness of the key elements, concepts and terminology used in the ITIL service lifecycle, including the links between lifecycle stages, the processes used and their contribution to service management practices. A Foundation Certificate certifies you have the requisite background to evaluate IT service management good practice and understand how the ITIL framework can improve the efficiency and effectiveness of service management within your organization. What is ITIL v3 Certification? ITIL v3 and ITIL 2011 both refer to the most current version of the ITIL. The training found on this page helps you earn the ITIL v3 Foundation 2011 Certification, the most recent version available. 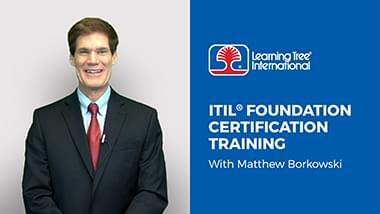 How do I get the ITIL v3 certification Foundation Certificate? Sit for the ITIL Foundation exam, administered on the last day of training or via PeopleCert’s online proctoring service. How long does ITIL Foundation Certification last? The ITIL v3 Foundation certification does not expire or require renewal, however, the most current version of the ITIL may be updated in the future. When that happens, prerequisite requirements for earning other ITIL certifications may change (for example, a course may require you hold the most recent version of a certificate as a prerequisite to earning a higher-level certification). Yes, both the on-demand and instructor-led training content and Instructors have been accredited by PeopleCert. How many questions are on the ITIL v3 Foundation exam? How do I take the ITIL v3 Foundation exam? Is there an ITIL continuous professional development scheme? AXELOS, the ITIL product owner, offers a Professional Development program (visit www.axelos.com), and completing Continuing Professional Development (CPD) activities will earn you a digital badge that shows that your skills and practical knowledge are current. What is the relationship between Learning Tree, PeopleCert and AXELOS? Both Learning Tree and this course have been accredited by PeopleCert. As an Accredited Training Organization (ATO), Learning Tree and its trainers have been approved to deliver this course and invigilate ITIL exams. PeopleCert is responsible for providing the examination papers, and marking and notifying Learning Tree and the learner of the results. The five ITIL core manuals are part of a suite of guidance owned by AXELOS Limited aimed at helping organizations and individuals manage their projects, programs, and services. The Learning Tree ITIL Foundation Certification Premium Training Bundle includes unlimited access to all Instructor-Led Training (ILT) or Virtual Instructor-Led Training (VILT) course and review session events throughout your annual subscription. The program provides comprehensive coverage of concepts within the Information Technology Infrastructure Library (ITIL). In order to pass your ITIL Foundation exam, you are given practical assignments, practice exam questions and daily review sessions. You will also explore and evaluate good practice in IT service management based on the ITIL methodology. You also assess the activities, roles and security issues involved in the service management lifecycle, examine the components of each of the core service management. Achieving the ITIL Foundation certificate provides two credits toward your ITIL Expert certification. Before your event, you will receive via email a Pre-Course Study Guide and the ITIL Foundation Handbook. The Pre-Course Study Guide will let you know which parts of the ITIL Foundation Handbook you should study before class. The Pre-Course Study Guide also contains the official ITIL Foundation Certificate syllabus, which you should read. With this premium package you will receive over 112 hours of demand content on ITIL Foundation, ITIL Practitioner, all nine ITIL Intermediate Lifecycle and Capability Certification tracks and the capstone Managing the Lifecycle course. Everything you need to progress your ITIL learning path beyond ITIL Foundation. You will also receive any updates so you can stay up-to-date with any changes within ITIL. What if I need Instructor support beyond ITIL Foundation? No problem, you can blend your on-demand training with our live Instructor led Practitioner and Intermediate classes. Questions about which ITIL training is right for you?